The Brimstone missile family is comprised of fixed-wing-, rotary-, and surface launched missiles developed and deployed by the United Kingdom. The baseline Brimstone missile, the United Kingdom’s version of the AGM-114 Hellfire, has served as the basis for the Brimstone Dual Mode System, Brimstone 2, Brimstone Sea Spear, and the Future Attack Helicopter Weapon (FAHW). 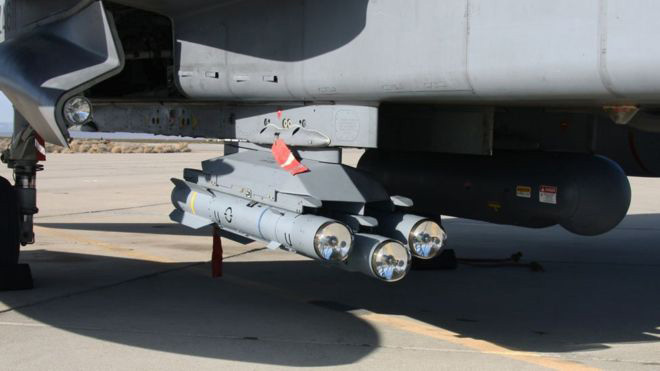 The origin of the Brimstone can be traced to the United Kingdom’s cancellation of the Royal Air Force’s (RAF) steerable cluster bomb (VJ291) program in 1978, a program which sought to improve the UK’s BL755 cluster bomb rather than purchase the U.S.-made AGM-65 Maverick.1 To replace VJ291, the RAF announced in 1982 the Staff Requirement (Air) 1238 (SRA 1238) for an autonomous, all-weather missile that can operate at standoff ranges. After considering several proposals, the UK Ministry of Defense selected the Macroni/Rockewell-produced Brimstone for development in 1988. In 2013, MBDA conducted initial flight tests of the Brimstone 2, with double the range of the baseline model. Brimstone 2 entered service with the RAF on July 13, 2016. The Brimstone family is set to be expanded further to include the Brimstone Sea Spear and Future Attack Helicopter Weapon (FAHW). Although Sea Spear and FAHW remain in development, both missiles have had successful test flights. The Brimstone 2 incorporates more advanced laser and dual-mode technology to better track low reflectivity targets, like camouflaged vehicles, in cluttered environments. Its improved Vulcan rocket motor reportedly doubles the baseline model’s range, extending the Brimstone 2’s reach to over 40 km.17 In addition to firing the missile farther, the insensitive motor is resistant to explosions, bullet penetration, or other environmental stressors.18 This safety feature ensures the missile’s small armor penetrating warhead does not explode prior to weapon release. The missile entered serial production on July 16, 2014, and was selected as the basis for the United Kingdom’s Selected Precision Effects at Range (SPEAR) Capability 2 missile.20 The Brimstone 2 completed its operational evaluation trials on the Tornado G4 in February 2016. During the trials, 11 missiles were fired at “structures, a very small fast moving vehicle, and [targets at the] edge of the weapon system’s performance envelope.”21 The only miss during the trials involved a very short range shot in which the missile did not have enough time to effectively acquire its target. The missile entered service on the RAF’s Tornado G4 on July 13, 2016, with plans to integrate it with the RAF’s Typhoon fighter.22 A Typhoon successfully test-fired the Brimstone 2 for the first time on July 14, 2017.23 The missile is expected to enter service with the Royal Air Force in 2018. The Brimstone Sea Spear is an air- and surface-launched antiship missile designed to strike fast-moving, swarming inshore attack ships. Although erroneously considered to be a basic adaption of the Brimstone 2, several features distinguish the Sea Spear from its predecessors. First, the missile is equipped with an inertial navigation system for midcourse guidance, in addition to a SAL and mmW seeker for terminal guidance.24 Second, the Sea Spear carries a 16 kg payload, 10 kg larger than any other variant, to ensure it can sufficiently damage fast inshore attack craft (FIAC).25 Third, the Sea Spear is designed to hit swarming targets, like small unmanned aerial vehicles or missile salvos, not merely fast-moving ones. The Sea Spear model anticipates future battlespaces that will not only present cluttered environments, but also more technologically advanced adversaries. When fired from a surface vessel, the missile uses a triple-rail launcher similar to the three-round pylon used for air-launched variants. The missile was developed simultaneously with the DMB variant, performing its initial live-fire tests on June 25, 2012, from Aberporth Range located off the coast of Scotland.26 On April 6, 2013, the missile was tested again from Aberporth, successfully striking a static Fast Inshore Attack Craft (FIAC) target. On May 29, 2013, MBDA tested three Sea Spears from a surface-launcher and hit three FIAC targets, including one mobile target.27 The missile remains in development, with completion expected in 2020. In September 2015, MBDA announced the development of a helicopter-launched DMB, dubbed the Future Atack Helicopter Weapon (FAHW).28 On July 14, 2016, MBDA and Boeing successfully test fired a Brimstone from an AH-64E Apache attack helicopter.29 The information gathered from this test will be used to optimize the missile’s performance as it remains in development. The Brimstone and DMB have been employed in numerous combat operations since they were declared operational in 2005 and 2008, respectively. Missile Defense Project, "Brimstone," Missile Threat, Center for Strategic and International Studies, December 6, 2017, last modified June 15, 2018, https://missilethreat.csis.org/missile/brimstone/. Malcolm Browne, “Invention That Shaped the Gulf War: the Laser-Guided Bomb,” New York Times, February 26, 1991, http://www.nytimes.com/1991/02/26/science/invention-that-shaped-the-gulf-war-the-laser-guided-bomb.html?pagewanted=all. Mike Markowitz and John Gresham, “Dual-Mode Brimstone Missile Proves itself in Combat,” Defense Media Network, April 26, 2012, https://www.defensemedianetwork.com/stories/dual-mode-brimstone-missile-proves-itself-in-combat/. Ministry of Defense National Audit Office, “Major Projects Report 2000,” HC 970 Session 1999-2000: 22 November, 2000, https://www.nao.org.uk/wp-content/uploads/2000/11/9900970.pdf. Ibid; David Hambling, “The UK will attack ISIS with missiles the US could only dream of,” Popular Mechanics, December 4, 2015, http://www.popularmechanics.com/military/weapons/a18410/brimstone-missile-uk-david-cameron-isis/. Ibid; Royal Air Force, “Brimstone,” https://www.raf.mod.uk/equipment/Brimstone.cfm. “Brimstone,” in Royal Air Force: Aircraft and Weapons, ed. Squadron Leader Brian Handy (United Kingdom: Royal Air Force, 2003), 87, https://www.raf.mod.uk/rafcms/mediafiles/0186cc2a_1143_ec82_2ef2bffff37857da.pdf. MBDAInc, “Dual Mode Brimstone: MQ-9 Reaper Test Shots,” Youtube video, 3:08, May 2, 2014, https://www.youtube.com/watch?v=P8ZOf8xp1no. Craig Hoyle, “Pictures: Brimstone 2 passes test against high-speed vehicle,” Flight Global, October 21, 2013, https://www.flightglobal.com/news/articles/pictures-brimstone-2-passes-test-against-high-speed-391932/. “Brimstone Sea Spear,” in IHS Jane’s Weapons: Naval 2016-2017, ed. CDR David Ewing Royal Navy and CDR Malcolm Fuller Royal Navy (United Kingdom: IHS, 2016), 122-124. Robin Hughes, “UK RAF completes Brimstone 2 operational evaluation trials on Tornado G4,” IHS Jane’s, May 4, 2016, Web Archive, https://web.archive.org/web/20160512031222/http:/www.janes.com/article/59977/uk-raf-completes-brimstone-2-operational-evaluation-trials-on-tornado-gr4. “MBDA’s Newest Missile Enters Service with RAF,” MBDA, July 13, 2016, http://www.mbda-systems.com/press-releases/mbdas-newest-brimstone-missile-enters-raf-service/. “Successful live firing of Brimstone missile from Eurofighter Typhoon completed as aircraft enhancements move forward,” Eurofighter, July 14, 2017, https://www.eurofighter.com/news-and-events/2017/07/successful-live-firing-of-brimstone-missile-from-eurofighter-typhoon-completed-as-aircraft-enhancements-move-forward. CDR Ewing and CDR Fuller. MBDA, “Brimstone Sea Spear Datasheet,” http://www.mbda-systems.com/product/brimstone-sea-spear/. Beth Stevenson, “Farnborough 2012: MBDA completes Sea Spear live-firing,” Shepard, July 10, 2012, https://www.shephardmedia.com/news/imps-news/farnborough-2012-mbda-completes-sea-spear-live-fir/. MBDA Missile Systems, “MBDA’s Future Attack Helicopter Weapon builds on combat proven Brimstone missile,” Youtube video, 4:39, July 13, 2016, https://www.youtube.com/watch?v=NX0hrj9sboM&t=5s. Geoff Ziezulewic, “MBDA fires Brimstone missile from Apache,” UPI, July 14, 2016, https://www.upi.com/Defense-News/2016/07/14/MBDA-fires-Brimstone-missile-from-Apache-helicopter/9021468503609/. Rick Kelsey, “From Egypt to Saudi Arabia, here’s who the UK is selling arms to,” BBC, December 19, 2016, http://www.bbc.co.uk/newsbeat/article/38365529/from-egypt-to-saudi-arabia-heres-who-the-uk-is-selling-arms-to. “Op Update 21 Dec 2008,” Royal Air Force, Web Archive, https://web.archive.org/web/20090812041455/https://www.raf.mod.uk/rafoperationalupdate/opsupdate/opupdate21dec2008.cfm. “Dual Mode Brimstone,” MBDA Systems, Web Archive, https://web.archive.org/web/20110601002618/http://www.mbda-systems.com/mbda/site/ref/scripts/EN_DUAL-MODE-BRIMSTONE_416.html. United Kingdom, Parliament, House of Commons, Defence Committee Ninth Report, Operations in Libya, January 25, 2012, 117, https://publications.parliament.uk/pa/cm201012/cmselect/cmdfence/950/95007.htm#a28. Karl P. Mueller, “Precision and Purpose: Airpower in the Libyan Civil War,” RAND Corporation, 2015, 168, https://www.rand.org/content/dam/rand/pubs/research_reports/RR600/RR676/RAND_RR676.pdf; Thomas Harding, “Libya: RAF fears over missile shortages,” The Telegraph, April 20, 2011, http://www.telegraph.co.uk/news/worldnews/africaandindianocean/libya/8463799/Libya-RAF-fears-over-missile-shortages.html. “Greater transparency and a grand strategy needed to defeat Daesh,” UK Parliament, September 21, 2016, http://www.parliament.uk/business/committees/committees-a-z/commons-select/defence-committee/news-parliament-2015/uk-military-operations-syria-report-published-16-17/. “Operational Update on Libya—March 25,” UK Ministry of Defense, March 25, 2011, https://www.gov.uk/government/news/operational-update-on-libya-25-march. “Brimstone Missile Destroyed Armored Vehicles in Libya,” UK Ministry of Defense, March 26, 2011, https://www.gov.uk/government/news/brimstone-missiles-destroy-armoured-vehicles-in-libya. Libya Conference participants committed to military action,” Ministry of Defense, March 30, 2011, https://www.gov.uk/government/news/libya-conference-participants-committed-to-military-action. “RAF and Navy patrol Libyan skies and seas,” Ministry of Defense, March 31, 2011, https://www.gov.uk/government/news/raf-and-navy-patrol-libyan-skies-and-seas. “PM visits RAF crews deployed on Libya operations,” Ministry of Defense, April 5, 2011, https://www.gov.uk/government/news/pm-visits-raf-crews-deployed-on-libya-operations. “Libya: RAF Tornados destroy seven Libya tanks,” BBC, April 9, 2011, https://www.webcitation.org/5xp8jSTzK?url=http://www.bbc.co.uk/news/uk-13023800. Karl P. Mueller, “Precision and Purpose: Airpower in the Libyan Civil War,” RAND Corporation, 2015, 168. “RAF destroys military vehicle depot in Libya,” Ministry of Defense, May 26, 2011, https://www.gov.uk/government/news/raf-destroys-military-vehicle-depot-in-libya. “RAF and Navy take further action against pro-Gaddafi forces,” Ministry of Defense, September 2, 2011, https://www.gov.uk/government/news/raf-and-navy-take-further-action-against-pro-gaddafi-forces–2. “RAF Tornados conduct strikes on Ghaddafi troops at Sirte,” Ministry of Defense, September 5, 2011, https://www.gov.uk/government/news/raf-tornados-conduct-strikes-on-gaddafi-troops-at-sirte. “RAF and Navy take further action against pro-Gaddafi forces,” September 8, 2011, https://www.gov.uk/government/news/raf-and-navy-take-further-action-against-pro-gaddafi-forces. “RAF aircraft target a former regime compound in Libya,” Ministry of Defense, Sepetmber 5, 2011, https://www.gov.uk/government/news/raf-aircraft-target-a-former-regime-compound-in-libya. “RAF continues strikes against Gaddafi forces in Sirte,” Ministry of Defense, September 27, 2011, https://www.gov.uk/government/news/raf-continues-strikes-against-gaddafi-forces-in-sirte.